“Exceeding client’s expectations” may not have been Bob Ashton’s goal when he established the business in 1951, but that is exactly what he achieved. Bob was from the old school. He was hard working, honest and reliable. He treated everyone with respect and never made an enemy. Bob’s clients knew his promises would always be honoured, as he was a man of his word. 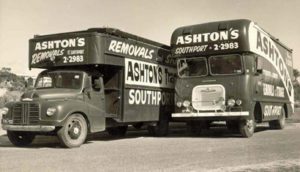 As a result, Ashtons Transport, as it was initially called, quickly became a household name on the Gold Coast. Reg Coutts had worked for Bob Ashton for many years. He was familiar with the culture of the business that had made it so successful. Reg knew customers kept coming back because they were always treated like members of an extended family. It made sense for Audrey and Reg Coutts to purchase the business from Bob Ashton when he put it on the market after 13 years. With the Gold Coast experiencing tremendous growth, it soon became apparent to Audrey and Reg Coutts that a specialised furniture removal and storage company was desperately needed. They gradually turned a general carrying company that handled some furniture, into a state of the art removal and storage company. In 1965, Audrey and Reg Coutts built the first purpose-built storage facility on the Gold Coast at Southport. This facility housed Ashtons Removals for almost 50 years until they moved into new facilities in Molendinar in 2012. John Pfeiffer, a nephew of Audrey and Reg Coutts, who had a background in Chartered Accountancy and for nearly two years, he worked for Ashtons Removals as the company’s Office Manager. When Audrey and Reg Coutts decided to put the business on the market in 1977, John and his wife Dianne, became the third owners of the company. Renamed Ashtons Removals, they have held ownership of the company for over 41 years. In mid 2008 Ashtons Removals purchased a local piano removal company, Concorde Freight Express. Since purchasing Concorde Freight Express, Ashtons Removals has conducted hundreds of piano removals in South East Queensland and has become the preferred piano removal company for some piano retailers and repairers on the Gold Coast. John’s attention to detail, a product of his accountancy background, and his emphasis on training and empowering his team members, have helped him in creating a thriving business on the Gold Coast. Over the years, Ashtons Removals has assisted countless families move their furniture and effects undamaged, and with minimum fuss. Strong family values remain the core essence behind Ashtons Removals high level of service. Since the early 1990s John and Dianne’s children have both worked in the business, and Kathy is still with the business in a senior role. 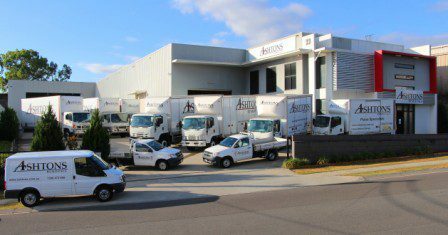 Ashtons Removals boasts of being the Gold Coast’s most experienced removal firm. It continues to set benchmarks for other removal firms to follow. The best part of Ashtons Removals is the team behind the name. The Ashtons Removals Team is completely dedicated to “exceeding client’s expectations” just like Bob Ashton did all those years ago.